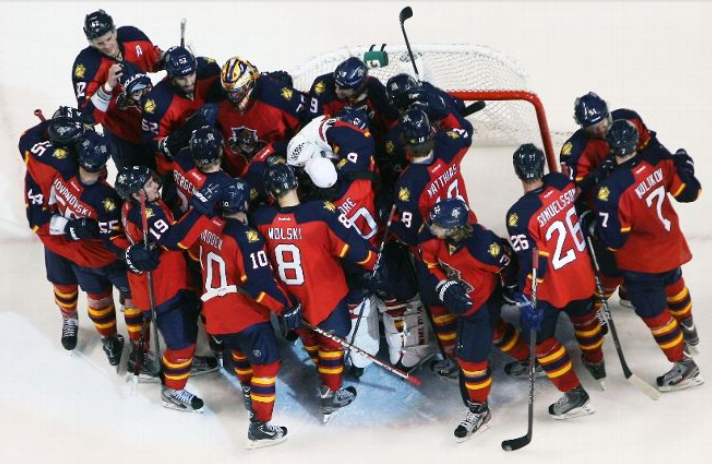 Well, the Florida Panthers’ visit to Habsland turned out to be so much better than their visit to NYC, huh? You know, that Monday night fiasco that quickly turned into the Brooklyn Disaster. As bad as Monday’s inexplicable 3-2 loss was to the Islanders was — and it was right up there as worst of the year, maybe because of its terrible timing with the postseason looming — the Cats’ bounceback 4-1 win over the Montreal Canadiens was a 60-minute effort. Granted it came against a Habs team that resembled an AHL club, but, really, who cares at this point about the circumstances surrounding any of these games? Did anyone really feel sorry for a rag-tag Florida (39-22-9) group that scratched Derek MacKenzie, Erik Gudbranson and Jussi Jokinen? Gudbranson’s absence was no surprise as he was seen limping around the dressing room following the loss in Brooklyn, but Jokinen’s ailment is just another in a slew of injuries and was a surprise. However, for Florida to compete at top level and succeed, key contributors 17, 44 and 36 need to be in the lineup. This is especially important in the pursuit of the Atlantic Division. Just as Super Tuesday resulted in a four-candidate field being reduced to three on the Republican side, mainly because of the Sunshine State no less, I’ve said for weeks that I feel the three-team race in the Atlantic will eventually be trimmed to two. Florida and Tampa appear to have an easier path to achieving the divisional title as compared to the Boston Bruins. Take Boston’s upcoming slate of games into consideration — and I write this as they lead San Jose 2-1 in the second period. Yet after that it gets no easier for Boston in its last 11 to end the season. Back-to-back games in Anaheim and Los Angeles at the end of the week, then traveling to face the Rangers next Wednesday. Florida rolls into Beantown the next night on a Bruins’ back-to-back. However, the real kicker is Boston going to St. Louis and Chicago to start April. The penultimate game is home against Detroit, who is fading and scrounging to hold onto the final wild-card spot. In total, Boston faces seven playoff teams in its final 11 contests. The Bruins will face five of those seven teams currently holding a playoff spot away from TD Garden. The Bs have been the NHL’s best on the road, but that’s a tall task ahead of them. I expect Florida and Tampa to reap the benefits of that, meaning the Atlantic winner would play Pittsburgh right now and the divisional runner-up would host Boston if the Bruins slip to third in the division. That will be a tough matchup for either Florida or Tampa. In short, I just don’t think the Cats and Bolts meet in the first round. But we still have a few weeks to figure that out. EMPTY-NETTER: Jonathan Huberdeau was given the A on his No. 11 sweater as he returned home to Quebec. The Saint-Jerome native showed he was worthy from the get-go, engaging in some rough stuff right away and eventually leaving a mark on the game when he slid a beautiful pass over to Sasha Barkov for the game’s final goal. It was Huberdeau’s 35th assist, second on the team to Jokinen. Interestingly, the Montreal fans seemed to cheer loudly when the primary assist from one of their hometown lads was announced in French. Say what you will about Montreal fans — they dress funny, they’re cocky bordering on arrogant, they feel entitled because of their rich history — but one thing is also worthy of mention: They are passionate about their hockey. That passion often translates into appreciation, which is why they cheered for their homey Huberdeau after he helped bury his childhood favorite team.